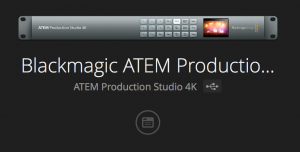 The ATEM Television studio is a video mixer. This means it takes several video inputs and outputs one of them, allowing you to change which one is being output simply and quickly at any time. It also has basic keying (live green screening, used for overlays as well) and media playing functionality. The ATEM has 8 physical inputs and 6 actual inputs, this means that at anyone time only 6 of the physical inputs are actually active and can be used, which inputs these are can be configured, how to do this is in the configuration section. The following are from left to right based on the diagram above. If you are unsure of any of the connectors you can find out more here. 4x HDMI Inputs – These are labelled 1-4, 1 & 2 are always active whilst 3 & 4 can be deactivated and replaced with SDI 3 & 4. 4x SDI Inputs – Tese are labelled 3-6, 5 & 6 are always active whilst 3 & 4 can be deactivated and replaced with HDMI 3 & 4. 1x SDI Ref Input – This is for a reference signal or world clock, these are used to sync up all of your cameras. This is almost never used and can nearly always be ignored. 1x USB B – When setting up or updating the ATEM you plug a USB cable from this port into your computer to be able access the control panel. 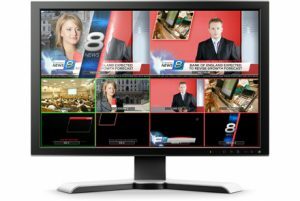 1x SDI Multi-view – This outputs a grid with all of your video feed as shown below and is connected to an SDI monitor if one is available. 2x SDI Program Out – This is an SDI output of of the final mixed video feed. 1x HDMI Multi-view – Exactly the same as the SDI multi-view but on a more useful HDMI connector. 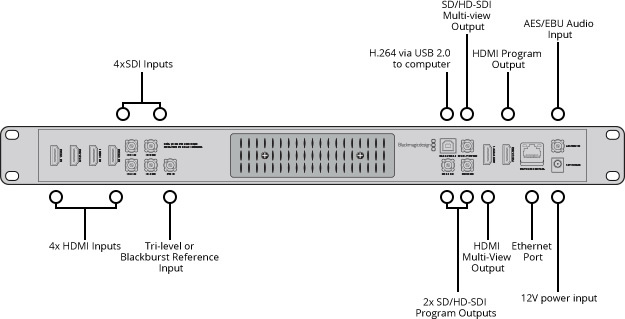 1x HDMI Program Out – Exactly the same as the SDI program out’s but with a HDMI connector. 1x AES/EBU Audio Input – AES and EBU are digital audio formats, these are extremely rarely relevant to use as we exclusively use analogue audio equipment. 1x Power Input – This is where the ATEM power supply is connected. It should be found in the box, if not make sure whatever you use to power the ATEM is 12V 2.5A 30W. To control and power the ATEM you need either a laptop or PC, it doesn’t have to be remotely powerful, a raspberry pi would handle it just fine! You then need to make sure that you have the ATEM control software installed, this can be found here on the left under latest downloads. You now need to connect the ATEM using the USB B cable and the Ethernet patch cable. Now open up ATEM Setup utility, if there are any pop ups asking you to update the ATEM click yes and follow the instructions on screen. It is quite important that the computer and the ATEM are both running the same versions of the control software. Once everything is fully updated you need to find the IP of the ATEM you have connected. To do this click on the button directly bellow as shown in the picture below, a popup window will appear similar to the one below, you need to copy or write down the IP address in the top box. Now you need to make your computers IP for the connection with the ATEM static, not your connection to the internet! The IP of your computers connection to the ATEM must have the same first 3 sections and a different number in the last one. For windows follow this guide, for macs follow this one. You don’t have to connect the ATEM directly to the computer, you can instead connect it to the same network, this would allow you to connect multiple ATEM devices to a net work and control them all from one computer, or one ATEM controlled by multiple computers, follow the same steps are you normally would but make sure everything has a uniqe static IP. Now you can open ATEM software control, it may detect the ATEM automatically, but normally you have to tell it the IP address of your ATEM. Once this is done the screen should fill with various buttons and a fader on the right. In the bottom left there is a little cog icon, click on that to change the settings. There are 3 tabs, general, multi-view and input labels. 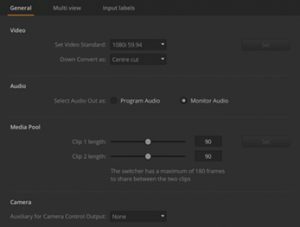 In general you can find the Video Standard setting, this should match whatever the inputs of your cameras are otherwise they may not show up, which should ideally be the same as the output format of your stream. The other settings can be left as is. Under multi-view you can change the layout of the multi-view display. 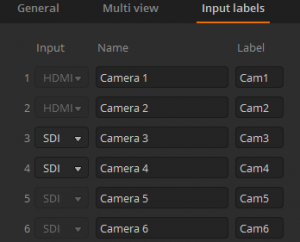 Under Input labels you can name each video feed which is displayed on the multi-view monitor, but more important you can chose whether HDMI 3 & 4 are active or SDI 3 & 4 are active via a drop-down to the left of the labels, as seen below.